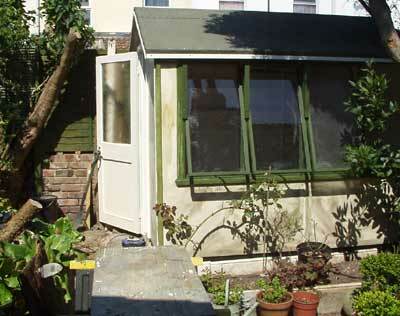 Strangely - buying an old seagull, with a thought to fit it as an auxillary on Lena - has resulted in a new and determined effort to eventually pull down the old greenhouse. Kitchens and seagulls don't mix too well, even if your single ! 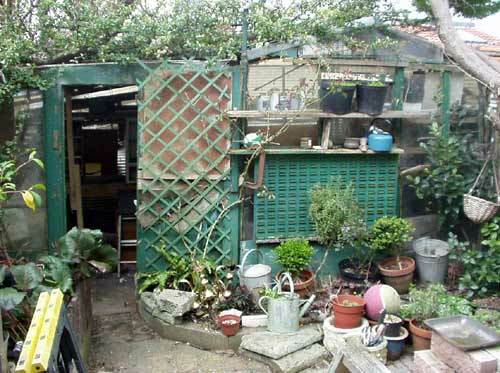 Basically, I just need a decent, dry, dirty workshop. So it goodbye old wreck of a friend. It wont take much effort to demolish ! I shall make sure the new one retains a bit of the old, as a bit of cladding here and there. New wall, new fence - wpb 9mm and 3x1 framing - sitting on a single course of 3" block around a concrete base - all sealed in with a membrane of bitumen - and sockets and lighting ! Wider and shorter than the old one - so I gain a section of garden to the left.